(TMZ) – Prince Frederic von Anhalt bought Zsa Zsa Gabor the biggest anniversary card he could find — in the form of a giant billboard overlooking Sunset Blvd. 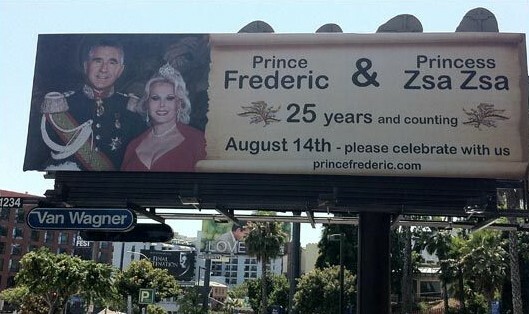 The Prince tells TMZ he forked over $68,000 to erect the 44-foot billboard for one month in the heart of Hollywood. Of course, Zsa Zsa is bedridden and can’t actually see it … but it’s the thought that counts. The couple will be celebrating their 25th anniversary on August 14 with a private party at their home. Although the billboard makes it seem as if the shindig is open to the public, as of now … we’re told that’s not the case. This isn’t the first time von Anhalt has erected a billboard on the Sunset Strip. Last time he was announcing that he was running for governor of California. $68,000 and they couldn’t hire a graphic designer? Or they did, and paid him/her $50?